In the early days of World War 2, it was realized that there would be a need for specific capabilities for airfield and road construction to meet the demand for more bomber and fighter stations. No 2 School of Airfield Construction was formed within the Royal Air Force No 24 Group Technical Training Command. This school was formed at a camp at Mill Green in 1942 situated between Ascots Lane, Hertford Road and Gypsy Lane. 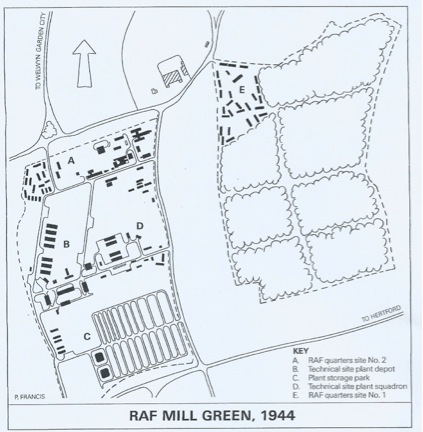 By 1943, the camp known as RAF Mill Green, had become the 5351 Airfield Construction Workshop. Before the formation of the school, members of the RAF trained with a private firm, Jack Olding and Co at no cost to the tax payer. Jack Olding had set up a company near Hatfield and was a main dealer in Caterpillar earth moving equipment and Deere tractors. Training took place on the Jack Olding site and on a piece of rough ground on the north side of the Hatfield to Hertford road. 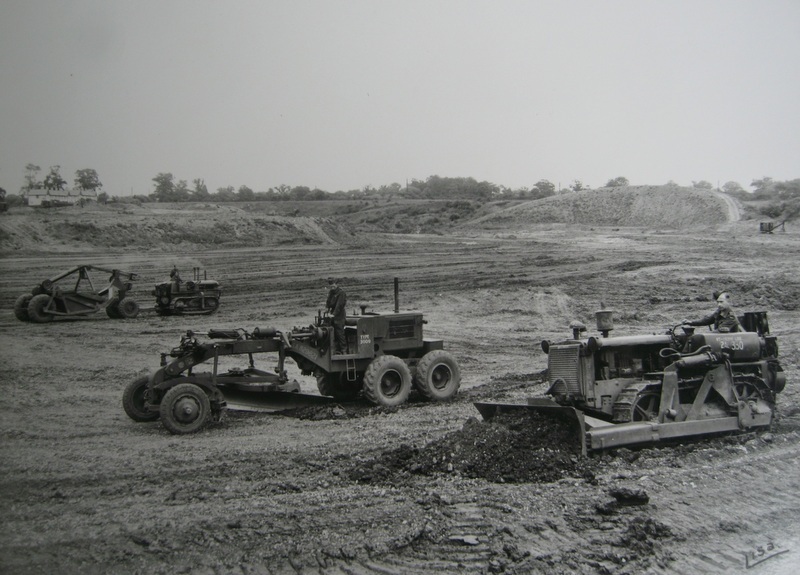 The Mill Green camp grew to include training, plant maintenance and a spares/repair facility with practical training taking place on a 20 acre site of an old gravel pit near Twentieth Mile Bridge in Welwyn Garden City. The quarry had originally been used to supply material for the building of Welwyn Garden City in the 1920s and 1930s. Life in the early days of airman posted to the camp was hard with the accommodation being relatively basic huts in the woods surrounded by mud roads and tracks. Leisure time took advantage of the local public houses like The Comet, The Beehive, Pear Tree, The Woodman, The Cherry Tree as well as the Green Man in Mill Green. A visit to the pub meant they had to wear wellingtons and carry shoes which they changed into once they reached Ascot Lane. The boots where hidden in the hedgerows, finding the boots on the way back was allegedly a challenge. The Community Centre at Hatfield Hyde was popular for dances and a favorite spot for most airman. RAF Mill Green closed in April 1948 when the depot moved to RAF Church Lawford near Rugby. The Mill Green site was passed to the Welwyn Garden City and Hatfield Development Corporation and was used to house construction workmen building the two towns. When the site was no longer required, the site was used as workshops. Mill Green golf course is now situated where the main site was situated. The accommodation area of the Camp is now the caravan site off Ascots Lane. The Twentieth Mile Bridge gravel pits now house the Gosling Sports Complex. The Jack Olding site is now a Tesco Supermarket and the original training ground along the Hertford Road is now part of the Mill Green golf course. More information including detail charts of the camp can be found at the Welwyn Hatfield Museum, Mill Green. What does the dove think?